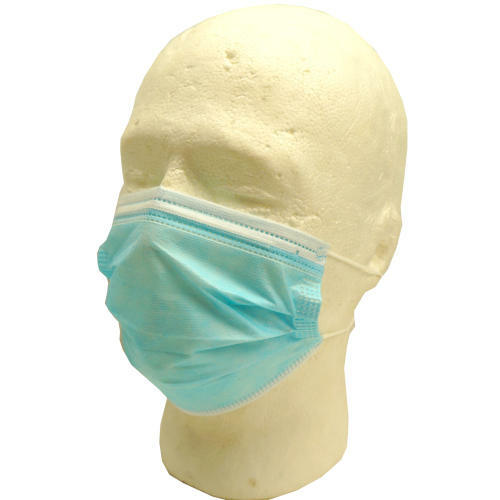 Extra-good quality disposable masks: Latex- and fiberglass-free, with a PVC nosepiece, 95% bacteriological and particulate filtration efficiency, and fluid resistance. Measure 7" x 3-3/4" with elastic ear straps and 4-fold, cone-shape construction. We'll pick a box of 50 white or pale blue. What's three feet tall and wears a white coat? A kid in a chemistry lab, and don't drink the sparkling water. Dress them right for everything from lab sciences to art projects. 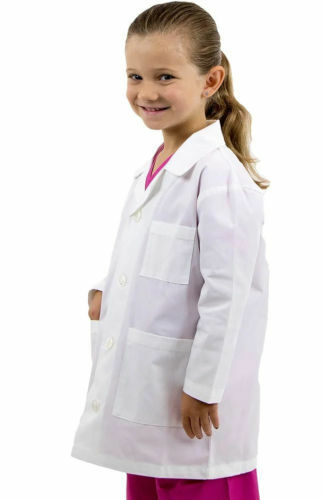 Our child-size lab coats are white cotton polyester, 4-button and hip length, with notched lapels, one breast pocket and two side pockets. You pick size 4, 22" long from collar to hem; size 8/10, 26" long; and size 12/14, 28" long. 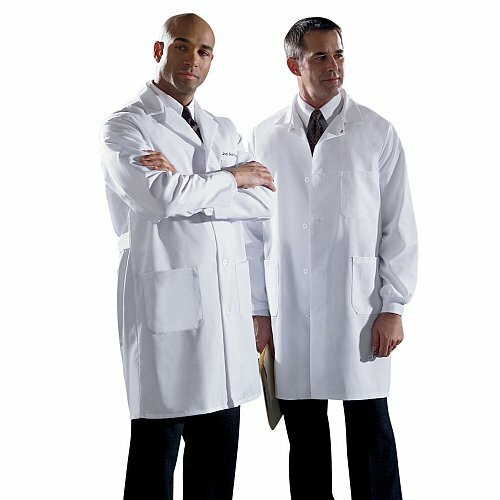 Our fashion buyers are just back from the shows in Milan with these brand new, nice quality, 80% poly/20% cotton lab coats. These are Euro-sizes, which generally (and generously) match chest circumference. The 42 has 34-1/2" sleeves, and the 48 has 36". All are about 39" long, which means fingertip length or mid-thigh, depending on how long you are. Think men's small and XL. They're all five-button, with one breast pocket and two large side pockets and have no name or embroidery added. Notched lapels, no vent-just what all the best-dressed technicians are wearing this season. 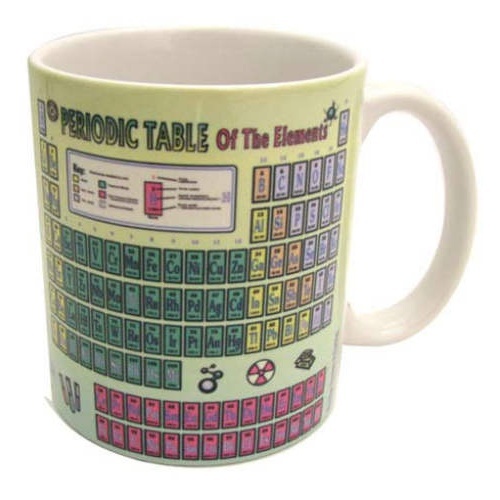 That'd fill this 9-oz ceramic coffee mug with the periodic table of elements printed on the side to about half a cup. It's printed in color on both sides, actually, in case you're left-handed. The atomic numbers and weights are a trifle small, but then they are atomic. They're coming. Women in white coats, too. They got them here, and said they were a steal. 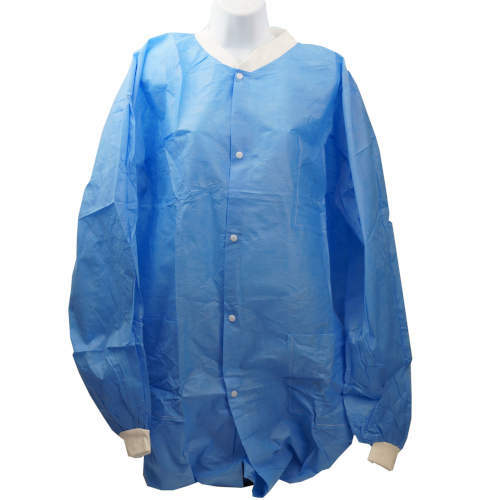 You choose from disposable, water-resistant lab coats, sizes Medium (36" long) or XL (38-1/2" long). Both with snap closures and waist pockets. Wear this to your chemistry final and see how far you get. 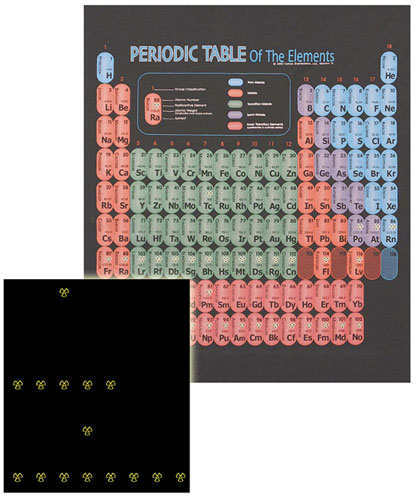 100% pre-shrunk black cotton T-shirt with a color-coded periodic table that includes glow-in-the-dark enhancements to the radioactive elements. Made right here in Chicago by guys with high GRE scores. Large only, because it's a big table. 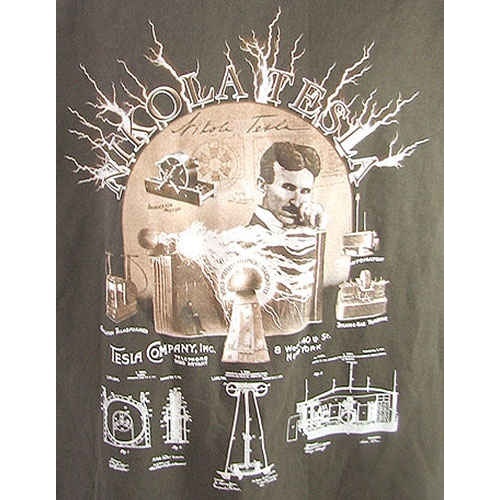 If Nikola Tesla were alive he'd be sporting this lovely chocolate brown and sepia T-shirt, especially because it glows in the dark. (Just like he probably did.) Below his GITD name is his face and below that are photos and patent sketches of his major inventions. 100% cotton. You pick the size. 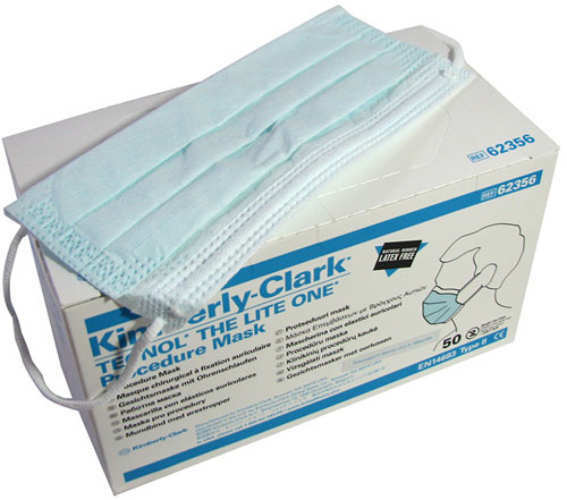 These Latex-free, natural-rubber procedure masks from Kimberly-Clark® measure approx 6-1/2” across x 3-3/8” with 2-1/2” ear loops. Branded: Tecnol “The Lite One,” they meet Euro standard EN14683 Type II. We have come into a cache of very nice short-sleeved lab coats, made for pharmacists. They're a white 80% polyester / 20% cotton blend with (1) breast pocket (left) and (2) waist pockets. They're 30" to 32" long, collar to hem, with lapels and 3-button fronts. Some are plain but most have a small logo identifying a pharmacy on the right breast. 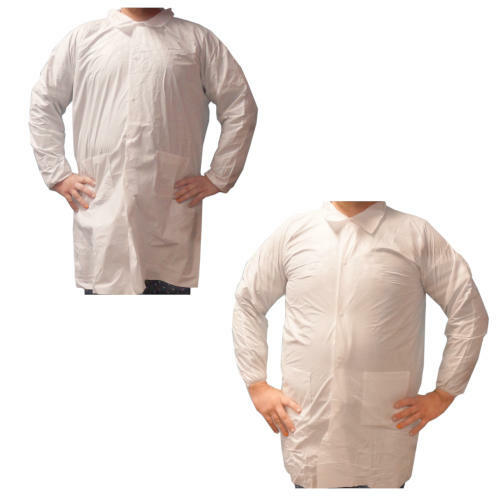 Mighty nice lab coats or painter's smocks. Colorful scrubs for kids. Nice PJs or play togs even if they don't plan a career in medicine. You pick the burnt sienna scrub pants with a half-elastic drawstring waist and one hip pocket in a kid's size medium, 6-8 or the forest green, short-sleeved V-neck scrub shirt in a kid's size large, 9-12. 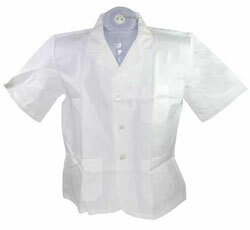 Nothing says lab-snazzy like these French blue Tyvek® lab coats with white collars and (knit) cuffs. 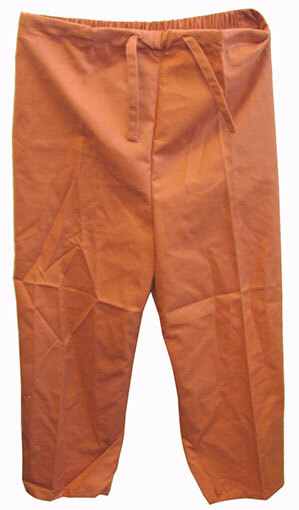 They have (3) pockets, including one breast pocket, and white snap closures. Our sizes are large and extra large and they measure 39” or 43"long, which is knee length on a surplus buyer.